I received this book in my August Prudence and the Crow box, the book selection was a fantastic bit of luck, as I’d been really craving classic children’s literature – between you and me I’m becoming more and more convinced that Prudence and the Crow are able to read my mind. From the a quick look at the front cover and the name alone – I know, I know, never judge a book by its cover, right? – I was expecting story about a mouse that fell in love with a windup mouseling. I’m sure you get the idea, something similar to Pinocchio, but English – so, perhaps with afternoons spent playing in dolls’ houses pretending to drink tea. I could not have been more mistaken, but, far from being disappointed, I absolutely loved it. “Where are we?” the mouse child asked his father. His voice was tiny in the stillness of the night. “I don’t know” the father replied. On a cold winter’s evening a tin father and son emerge from a box to stand on display in a toy shop window. Outside the cold wind blows and tramp passes by, momentarily taken by the sight of the toys. Brand new, and confused, the mouse and his child struggle to comprehend what it means to be windup toys and the thought of the life that lays before them makes the poor child cry. It is not long before they are swept away, bought by a family, destined for a life spent dancing beneath the Christmas tree – the life of a windup. It is a simple life, spent quietly fulfilling their duties; until they break the ancient clock-work rules and must face the consequences. Discarded in the snow the mouse and his child begin a wholly different journey than the one written for them. They are rescued, repaired by a tramp, and chased by a terrible force that would see all windup toys turned to slaves. Through all that they endure the mouse and the child wish for only one thing, a place to call their own – a magnificent house, a mother, and a sister. I wish I could say that I had read this book as a child. This is definitely a tale that will take on an entirely different meaning, and gain resonance as a person grows older. I spoke about the book with a colleague when I had just started reading it, and he said that he loved it as a child, but upon revisiting it as an adult realised, quite simply ‘wow, this is really deep stuff’. I could try and say it more eloquently, but that is the bare bones of it. 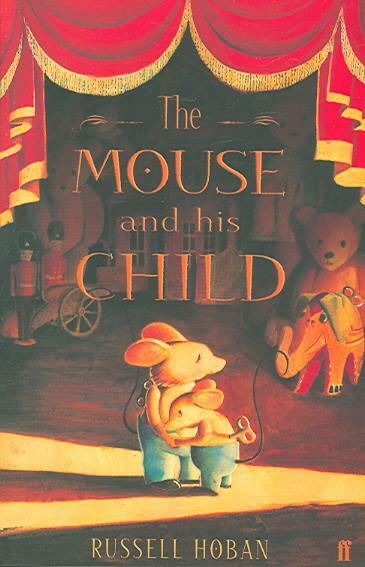 The Mouse and his Child is an incredible tale of quest and determination for children, and when viewed with an adult’s mind it is absolutely brimming with philosophical thoughts, lessons, analogies, and big, gaping questions about life. The humanity of Hoban’s characters is truly incredible. The authors has taken windup toys and elevated them to the next level. Each toy, however minor their role in the tale, has its own unique drive and personality: the once-proud elephant, now plushless, and with the missing ear and eye patch; the tin seal, long separated from her colourful ball; the sweet child, forever asking questions, always looking, and understanding; and even the donkey – the poor, poor, donkey – who once dared to complain. These creatures may be made of clockwork, but they are no less human than you and I. They are exhausted, frightened, frustrated, despondent, sentimental, joyous, hopeful, and forever working towards their goals. Life throws its hurdles, and each one is tackled, even if it does take a short lifetime. Can you imagine what it would be like to spends years at the bottom on a pond? Through all this, they grow stronger, never losing sight of their aims, growing, learning and interacting with all whom cross their path. Just one more step, they will get there in the end. The mouse and his child, who had learned so much and had prevailed against such overwhelming odds, never could be persuaded to teach a success course… The whole secret of the thing, they insisted, was simply and at all costs to move steadily ahead, and that, they said, could not be taught. The Mouse and his Child is a truly phenomenal children’s book, which has just as much, if not more, to offer to adult readers. I feel really thankful to have discovered this book, and look forward, truthfully, to a time when I can share it with the children in my life.